DONE!! Actor survey contest winners soon to be announced. I have finished reading the roughly 200 actor surveys that arrived in time for the contest deadline (there are another 50 to read, but they’re not eligible for the free career consultation; I will read them eventually, though). I hope to have selected the three winners by January 1st, 2009. Keep your eyes peeled! This process has been fascinating. I’ve heard from actors from all around the world: The US, Canada, Australia, Italy, France, the UK, Costa Rica, Chile, the Caribbean, Ukraine, Croatia and more. Ages 8 to 70+. Every language, religion, ethnicity, persuasion (and combination thereof) that you can imagine. 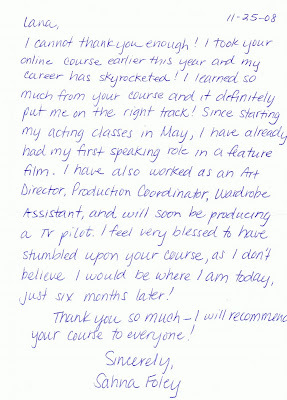 Aspiring actors in small towns and major cities; from beginners to veterans. Some who have been acting since they were three; others who are just starting out in their 40s and 50s. Some of you work in other aspects of the film business (including an animal trainer); some found acting through other artistic pursuits, such as dance or singing. Some are parents or grandparents, and at least one is pregnant! Thank you so much for sharing your hopes and dreams; your fears and frustrations. A clear picture is emerging as to what you’d like the focus of my book and other materials to be and I appreciate you being a part of the process. There will be more opportunities to lend your voice in the months to come. Heck, I may even do some more contests; it’s kind of fun! Calling it a day. Stay tuned. I am going to try to power through and finish the remaining actor surveys, so we can announce the three winners of the free 60-minute career consultations worth $100 apiece. In the meantime, here are some more answers to actor questions. Hint: Before posting a question in the comments area, please read the answers I’ve already posted on the blog. We’re getting a lot of the same questions over and over. There are links on the right sidebar with tags and everything, so you should be able to find answers. Thanks! Please keep in mind as well that there’s not enough time in the day to answer individual requests. We can teach you to fish, but we can’t do the fishing for you. 🙂 You should be armed with all the tools you need, though, if you just read up. Q: How do I get one of those personal phone consultations with you? Q: Can a person get a phone consultation without having to win it? If so, how can I do that? Q: Are you offering your $100 career consults to people, even if they don’t win the contest? A: It’s not our intention, but since we keep getting asked, we may consider a limited number of requests on a case-by-case basis. Shoot an email to tools4actors [at] slateplease [dot] com to discuss. Be patient; we’ve got a lot on our plates and are not fully set up to accommodate these requests. Thanks. Q: hi lana! i have a question… well…first.. i’m mexican, i live in Nuevo León, i’m thirteen, and i wanna be Jane in New Moon.. i really want it! i don´t have any experience, but i know that I can do it very well…i speak english a 85% or more, but i can’t go for the casting cause you know.. “money”… but if i could send you a video i could show you that i can act very well… i really want to be JANE!! she is a very interesting character… please…!!! Q: hello, I’m french and I know that it’s impossible for me to be considered by the casting director but my cousin lives in LA and i could live there for a moment, so maybe they would consider me? no?? and i speak english very well, I got US accent. Q: Can an Asian be on the film? I’m an asian (Indonesia), am i still have a chance to be just being auditions? Q: Hey do you think they would cast somebody from ireland? as i would love to be in new moon and i love acting although i have no experience except for the school plays i have done and i dont have an agent either do you have any advice on how to get an agent? thanks. Q: I am a 16-year-old aspiring actress in washington, and i am completely interested in acting in the twilight saga. I am most interested in playing Kate from the Denali Clan though. Q: Oh my goodness! I’ve heard some gossip or rumors of that they want the New Moon movie to be out in a year. If that is so, when does the cast stop? Who is really in charge? Where is the direct info.? What if you have a daughter who sometimes lives with a parent/guardian in California and sometimes on the east coast? What would happen (if the possibility were possible)? Q: My boyfriend is 6’4″ and perfect dark skin long black hair, he would make a perfect wolf! I want information on castings or where to send his headshots please!!! A: As I’ve mentioned several times before, our office is not casting “New Moon.” By all indications, it is shooting in Vancouver BC. Despite this fact, we are still getting flooded with questions. (FWIW, I covered both of these before in this post and this one). The production company needs to hire someone who can legally work in the country where the film is shooting. This means you need to be a citizen or have a work permit already. f. You have already received significant recognition for achievements from recognized critics, organizations, government agencies or other experts in your field. In other words, if you’re not a star, the production company is not going to bother with the risk and hassle of all this paperwork. There are plenty of experienced, legal actors available in the cities where the film is shooting. 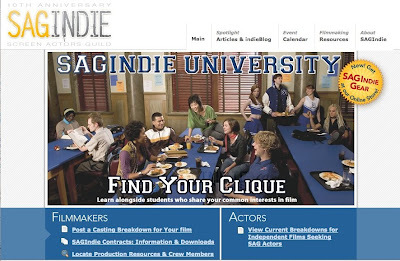 You usually need to be a member of one of the actors’ unions, such as SAG, AFTRA or ACTRA in order to be hired. Producers are required to consider all available and appropriate union actors for a role, before looking at non-union actors, otherwise they risk getting fined. If you’re not already an established actor, it’s unlikely you’ve got your union card (particularly if you reside overseas). Stars or established actors will likely be hired to play the main characters, not unknown entities. As you can see, most of the emails I’ve been getting on this subject have been from members of the last two or three categories. Their odds are slim. As mentioned in this post and this one, the minor speaking parts will be cast on location, using local actors. Location casting directors like myself will start from category C above and work our way downwards. You may have a shot at one of these smaller parts, but the higher you are on the list, the better your chances. Again, extras will be hired in the region where the production is based. You do not need experience to work as an extra, but you do need to live locally and be able to work legally. I discuss working as an extra at length in this post and in this one. That’s it for now. Next time, I’ll try to answer some of your questions about talent agents. At this time of year, I love reflecting back on the goals I set for 2008, seeing which ones I achieved, which ones I didn’t and setting new goals for 2009. For three actors (or aspiring actors) who completed my Actor Survey in November, the New Year will be a productive time as well, since I’m close to announcing the winners of the FREE career consultation worth $100. I’m on Actor Survey number 152 of 200 and hope to have read through all of them by January 1st. Each winner will receive a one-hour phone consultation, to discuss his or her career path in the acting business. With over 20 years in the industry and 10 years casting thousands of actors, I can provide guidance on training, finding out about auditions, moving your career to the next level, making connections and so on. The advice is practical, real-world information, as you can judge by the curriculum of my former online course, which was taught in colleges around the world for years. I’m no longer offering this course online…but my upcoming book and collateral products will be even better, since I’m developing them with the help of actors like you. The three lucky winners will start their year with a checklist of tasks to move one step closer to their goals. Very exciting! Whether you win the casting director consultation or not, now is a good time to take stock of where you are in your life and where you’d like to be a year from now. It’s essential to set smaller goals, but I also like to have one overarching goal for the year. Last year, one of my friends decided that her theme was going to be “total immersion” in her writing career. I loved that! It helped define all the other goals on her list and also helped eliminate everything that might distract from her goal of total immersion. You don’t know what you don’t know. Sometimes we set a really lofty goal, without realizing there are several other steps that we need to accomplish first. This can cause disappointment when our objective is not reached in the time frame we hoped for. So be open to learning as you go along and adding sub-goals to your list, to account for the knowledge and expertise you need to develop in order to achieve your larger goal. As long as you keep moving towards it, you’re doing great. There’s nothing that motivates me more than spending a small portion of my day gleaning knowledge, ideas and inspiration from other successful individuals. This classic book is a treasure for creative people of any medium, not just writers. 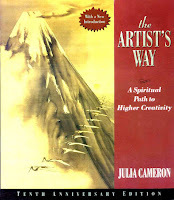 A popular book leading you through a twelve-week program to recover your creativity and develop artistic confidence and productivity. So, readers: What are your goals for 2009? What is your theme for this New Year? I’d like everyone to post theirs below in the comments (or, if you’re not already on the mailing list, opt in on the right sidebar of this screen. Once you’ve received your subscription confirmation, shoot us an email with your goals. We can check back months from now to see how you’re doing. I’m throwing down the gauntlet: Let’s see if we can get 100 posts. Following up on yesterday’s advice to a parent whose 14-year-old wants to pursue a career in acting, here are some clips on two of the GREAT acting coaches of our time. Read up on them. Learn about them. And here’s a short clip I just found by the insightful Judith Weston, author of “Directing Actors,” that basically covers everything I wrote yesterday about distinguishing a good acting teacher from a bad one! 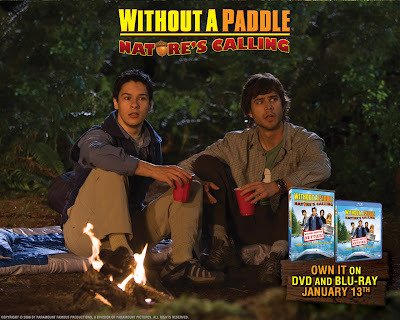 On DVD in January: "Without a Paddle: Nature’s Calling"
Without a Paddle: Nature’s Calling, which we helped cast earlier this year, is available on DVD on January 13, 2009. Congrats to Todd Robinson and Robert Blanche! Soooo many burning questions…so little time! Because we worked on “Twilight,” we’ve been getting swamped with questions about the sequel for months on MySpace, in the blog comments and elsewhere. Just so everyone’s clear, our office has not been hired to cast “New Moon,” but we understand that it’s frustrating not knowing what’s going on, so I’m happy to answer questions as to how things usually work when it comes to casting. Hopefully this will provide some clarification for you. Q: Quick question about the working-out-of-the-country bit, if you could answer it when you get a chance: my daughter is planning on trying out for the part of Jane (a vampire in Italy)- if by some crazy chance she is considered for the part and that part is filmed in Italy what would that mean for a 12/13 year old from California? A: When an actor is hired to play a lead or supporting role in a film that shoots in a foreign country, the production company handles work permit issues. For smaller day-player roles, though, casting usually takes place on location, especially if actors fitting the specifications of the role are widely available there. Q: I am French and I live in France, but I nevertheless sent a photo therefore me is possible give up a cross my chances to be taken. Of a very way I made me not too much phantasms. As you said it “hope helps and makes dream”. Q: My dream is to play Jane. I’ve got Italian origins, but… I live in France ! Why do all the good movies shoot in the USA ???? Q: Can you give some info about the Italian casting? or for extras casting in Italy? Q: I’m Australian/Italian, and I hold an Italian citizenship and passport, what would this mean for me in relation to the Italian casting? Q: Hi Lana! I’m Italian and I’d like to know more information about the italian casting…just for an appearance! Q: This makes me depressed to be living in New Zealand! ARGH. A: If you live in Europe, it’s highly unlikely that you’ll be considered for the North American casting. You may have a shot at the Italian casting, if you live in Italy, particularly the extras casting. But as far as we can tell, nothing has been announced anywhere to date. Q: What about Canada? Is there a chance the casting could happen here in Canada? Because I heard “New Moon” was being shot in Vancouver. Q: Does anyone know where in Vancouver it will take place? Q: Hi, I was wondering where to send my resume and picture to? Thank you. Q: I live in NJ, not CA or WA. What do you think that the chances would be of any sort of casting in my area? I know that they’re shooting in some of the same areas again, so I doubt my chances are high. I would only be interested in extra work for New Moon or playing Bree (if she was left in the movie, which she might not be) in Eclipse. She’s a pretty minor character, but she appears to be fifteen, which is my age. Q: I’m an actress, but I live in Georgia. I have agents here, but a manager in California. I remember a small part in Eclipse where there were a bunch of newborns, some teenage girls. I was wondering if that will be cast locally, also, since it’s not a lead or an extra. A: It appears that “New Moon” is set to shoot in Vancouver, BC, but no information has been publicized about any casting taking place anywhere yet. Patience. Lead and supporting roles are likely to be cast out of LA. Day player and extras roles will be cast in the cities where the shoot is taking place. Q: I’m 18, Native American and I live in WA. I have NO acting experience other than playing “pretend” as a child. What do you think my chances are for the role of Leah Clearwater? Q: Okay, so I have zero acting experience in the business sadly, but I was interested in playing the role of Leah Clearwater and I live in NJ how are my chances? A: Production companies will always start with trying to hire the most experienced, established actors first. If they can’t find anyone who fits the bill, then the CDs (i.e. casting directors) may hold an open casting call. But there are a lot of experienced, professional, union actors out there who will be considered first. See my post: Are the lead roles REALLY reserved for just the famous actors? Q: What are the chances for anyone with no experience to be in the movie…even as an extra? Q: I live in Toronto and am visiting Vancouver for the March Break. Is there any possibility I can be an extra in any scene during that time frame? Q: What if I live in Ohio and I want to be an extra, just to have this experience and participate in a movie involving Twilight? So I just need to send the casting agency headshots and my resume? Also what is the age requirement? I am 14. A: Extra work does not require experience, but it does typically require that you be based in the city where the shoot is taking place. If you are not based there, it is highly unlikely you will be chosen; there are too many risks involved. See my previous post entitled: Breathe, Twihards, Breathe under Location and Extra Work. Do you have friends or relatives you can go stay with on location for a few weeks? At least then you’d be on hand to attend any open casting calls that may be publicized, register with the local extras casting company (once it’s been announced) and cross your fingers that you might get a phone call. This may help your chances somewhat, but will not guarantee in any way that you will be needed. You must also be able to legally work in the country where the shoot takes place. No one will provide work permits for the background actors. As for the age requirement, the needs differ with each shoot. When it comes to minors, producers generally prefer to hire older people to play younger, due to child labor restrictions (the younger an actor or extra is, the fewer hours he or she is allowed to work; producers want the flexibility to shoot longer hours, if needed). So if you look young for your age, you have an advantage. If the script calls for extras age 10-12, for example, producers may choose to hire 12- to 14-year-olds who LOOK younger instead. If the script doesn’t specify age ranges and producers have the choice, in the US they will generally try to hire actors who are at least 16. Eighteen and older is even better, because they can legally work the longest hours in a day. The laws may differ in other countries. Q: I was wondering if you knew where the cities for the extras castings would be located. I live about 170 miles from LA and was just wondering if there would be any there. I’m a 16-year-old young man, kind of a medium tan color with green/blue eyes (they change colors). I have a some acting experience when it comes to plays/musicals and O was wondering if there was any part that you think I could be able to play. Q: If I want to be an extra, when can I register for it? I live in CA and I read that there were going to be Extras Casting in Los Angeles. 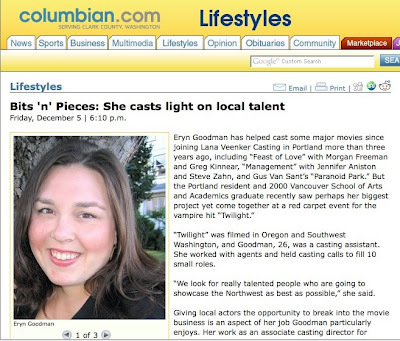 Q: I would like to be an extra in New Moon, and I live about 2 miles from the heart of Seattle. 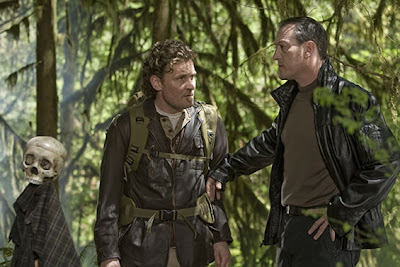 Any chance they’ll be shooting around here (or within WA/OR state) again? Thanks! A: It appears that “New Moon” is set to shoot in Vancouver, BC, but no information has been publicized about any casting taking place anywhere yet for the principals or the extras. There will also likely be some extras casting in Italy, for people based there. No news as to when or where. Q: Pretty please tell me that you ARE NOT going to recast Jacob!!! Please keep him! Q: Are you really planning on recasting Jacob? I know Taylor isn’t the biggest guy, but I know a lot of girls at my school wouldn’t be very happy. We love Taylor because he is so close to our age and cares about all of the fans. A: I’m afraid I don’t have any say in that! It does look like something is in the works regarding the role of Jacob, according to MTV.com. I have been sidetracked this week by computer & network problems, bookkeeping, bills and invoices, tons of email, various meetings, non-casting projects, event coordinating and all kinds of company development stuff. Not to mention the holidays and all that. Which means I’m behind on my surveys!! BUT…today I have to sit around for three hours at the mechanic’s while the timing belt is replaced in my car and I’m taking the laptop! Are lead roles REALLY reserved for just the famous actors? We received this email in response to a comment Lana made in her post entitled Breathe, Twihards, Breathe. Except in rare and publicized cases, lead roles in big movies are typically destined for established, name actors. I disagree with your statement that roles in big movies are destined for established, name actors… This is Rob Pattinson’s first lead role ever and only his second major role (the only other noteworthy one being in Harry Potter)! What distinguishes a great talent/casting agent from an average one is that the great ones are constantly looking for new and exciting actors, for people who have presence, skill and charisma and are yet to be discovered. This is even more true for a teenage movie because many people do not have long resumes at such a young age unless their parents are extremely persistent. All famous actors had to start somewhere and a casting manager/director took a leap of faith with them, often times casting them in a supporting or even lead role after just a few minor projects before (think Julia Roberts in Mystic Pizza or Rob Pattinson in Twilight). In every major film, there are a certain number of roles that are “above-the-line” (i.e. the stars) and the remaining roles are considered “below-the-line” (the rest of the cast). The budget for the below-the-line roles is fixed. For example, the producer knows he or she needs to hire 12 supporting actors and intends to pay them all SAG scale (the minimum day or weekly rate allowed under union rules), plus their agency fees. The budget for each of the above-the-line roles needs to be negotiated. The producer knows he or she has four leads to cast and has reserved, for instance, $10 million dollars for this. If a big, very famous actress is hired and her agent negotiates $8 million for her alone, that leaves $2 million for the remaining three leads, if the producer doesn’t want to go over budget. So he or she may decide to cast two slightly less famous actors at $4 million apiece, and spend a million each on the remaining two leads. Or whatever. For these above-the-line roles, the production company and its investors want to get the most bang for their buck. Which actors will put most seats in the movie theatres, to ensure the investors earn their money back and make a profit for themselves and the production company? It is a business, first and foremost. 2. If not name actors, then established actors will most often be cast in the lead roles. The reader is correct in saying that up-and-coming actors have a great opportunity in teenage movies. No one expects young actors to have a resume as long as George Clooney’s. In most cases, however, when casting the major roles, producers choose to bank on the most experienced young actors, in order to reduce their risk. Keep in mind that thousands of actors who are unknown to the general public are NOT unknown to casting directors. 🙂 The leads in “Twilight” had already been doing the rounds in LA or New York for some time, going out on multiple auditions for various projects. Sometimes, they may have been cast in small roles or they may not have even been cast at all, but they made a positive impression on the casting directors, so that when the right roles presented themselves, the CDs knew whom to call. Example: Anna Kendrick, who plays Jessica in “Twilight,” may not have been known by your average moviegoer a year ago, but casting directors knew that she had been nominated for a Tony Award on Broadway when she was just 13; they likely had seen her demo reel of other film and TV performances; they knew which other projects she had recently booked AND they surely had auditioned her dozens of times before. That’s how they roll! In fact, I don’t think any of the actors hired to play the Cullen kids or Bella’s friends had fewer than eight or ten IMDb credits prior to “Twilight” (not counting the many other credits that haven’t been posted to IMDb; trust me, there are many). So, while it may SEEM that many of the actors were unknowns, to industry people they weren’t. 🙂 They were proven entities that casting directors could feel confident recommending to the director and producers. Does that make sense? 3. The really great talent agents and casting directors are constantly looking for new and exciting actors, for people who have presence, skill and charisma and are yet to be discovered. Yes, absolutely! This is one of the favorite parts of our job. The entire teen cast of Gus Van Sant’s “Paranoid Park” (which we cast) were complete unknowns, with the exception of Taylor Momsen. In that project, however, Gus specifically wanted untrained actors, so that was an unusual circumstance. We placed Solomon Trimble in “Twilight,” Alex Mentzel in “Feast of Love” (opposite Greg Kinnear) and many other young actors in their first Hollywood films. It’s hugely gratifying when this happens. Solomon was not unknown to us, though: He had previously auditioned and been cast by our office in other smaller projects, so we were aware of his skills and professionalism. Young Alex had been doing theatre for quite a while and also demonstrated his work ethics through several rounds of auditions. 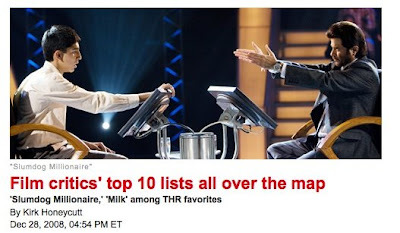 Note that neither were cast in above-the-line roles. In most cases, actors need to first demonstrate their ability to carry a lead role in a smaller project or a smaller role in a big project, THEN reach for the next rung, if they want a producer to take a big risk on them. So get to work and start getting those first credits on your resume. You never know where it might lead! We hope this clears up a few things and thank our readers for taking the time to comment. Until production gets underway and filming locations are confirmed, no auditions will be taking place anywhere, as the casting and extras casting directors haven’t even been hired. Open casting calls, if there are any, will be announced in the cities where they are taking place. Be patient, grasshoppers! By the way, there’s no need to send headshots and resumes to the production company; they’re not doing the casting and your materials will end up in the trash. Let the casting directors sort through the thousands of submissions; that’s not the production company’s job. Except in rare and publicized cases, lead roles in big movies are typically destined for established, name actors. Producers have to cast people who are already famous in the leading parts, to raise money and to reassure their investors that people will show up at the box office. That’s just the business. They are also typically required to hire actors who are members of one or more of the acting unions (such as the Screen Actors Guild). If you don’t have a track record, you need to start building one by getting some training, auditioning for smaller projects and adding credits to your resume. 99% of the time, producers will not pay to travel an actor to play a role (unless he or she is famous; see above). So, to be considered at all for a role, you should either look for films casting in your area or move to a city where films are being cast, in order to be a local. Yikes! Too much stress in an already stressful business. It’s safer to hire actors we know and love, and who live within the vicinity of the shoot. There is no shortage of willing and available talent in our own backyard. Our job is to reduce the risk of problems for our producers, not increase it. So get to know your local casting directors and start there. This is one thing you can do without acting experience, but keep in mind that you can only work as an extra in the region where you live. If there’s a movie you want to be in and it’s shooting halfway across the world, you need to either move there or have a place to stay for a few weeks (and even then, there’s no guarantee you’ll definitely be needed). Also, for those who have been contacting us from overseas, you need to be able to legally work in the country where the film is shooting. The production company won’t hire you without a valid work permit or proof of citizenship. Unfortunately, those are the breaks! Hope this helps. We’ll post more answers to your burning questions here, so be sure to bookmark us or add us to your RSS feeds (see links at the top of the right sidebar). …what, was Count Von Count not available? Thanks, Sahna! We’ve received hundreds of testimonials over the years, but it’s always appreciated when students take the time to share their personal success stories with us. UPDATE: As of September 2008, Lana is no longer offering her course through colleges and universities…but the good news is that she’s updating and expanding the material–with the help of actors like you–and will soon make it available to the general public. If you’d like to participate or just be kept in the loop, be sure to join our mailing list in the right sidebar. We won’t spam you or share your email address. This may be somewhat off-topic, but as everyone knows, non-profits are really struggling these days. As a company, we’ve decided this holiday season to make donations to various charities in the names of our clients, instead of sending them gift baskets, chocolates or other treats. Saves everyone’s waistlines and helps those who really need it! Here are some of the non-profits that Lana Veenker Casting donates to throughout the year and additionally this season. Please check out their websites and consider doing the same. It feels great! Started by Lisa Shannon, a filmmaker and screenwriter from Portland, Oregon (and one of Lana’s closest friends), it benefits victims of the world’s deadliest war since WWII. The latest outbreak of violence over the past few weeks has forced more than 250,000 to leave their homes, bringing the total number of displaced to more than 1.2 million. LVC has sponsored almost a dozen women and their more than 60 children, and has inspired others to become sponsors themselves. Watch the video. When the three-year-old son of a local actress was diagnosed with leukemia (A.L.L.) last year, Lana Veenker Casting helped organize a blood donation drive in his name. The Red Cross has a continuing need to replenish its supplies and needs all blood types. Here are some other organizations that LVC has often supported. Spread the love! Thank you to the hundreds of actors who participated in our survey! We are overwhelmed and excited by the response. It will take some time to read through everyone’s responses, but even what we’ve read so far is amazing. Once we’ve selected the winners of the one-hour career consultation with Lana, we’ll make an announcement here. NOTE: If you didn’t get the chance to complete the survey, you still can, although you won’t be in the running for the contest. We’d love to hear from you anyway! Stay tuned for other ways to participate in the making of Lana’s new book and other materials, and for lots of FREE content to help you find your way in this crazy biz. PS: If you haven’t signed up for one (or both) of our MySpace pages (Lana Veenker Casting for actors and Rutabaga Background Casting for information on working as an extra), be sure to do so. Remember you can also follow Lana on Twitter to see what she’s up to and be the first to find out when we post audition news, urgent casting requests, actor opinion polls and miscellaneous free stuff. We love you, actors!!! Keep dreaming big.